December 14th 2013- Snow 3.5in. First Snowfall over 2 inches this winter. December 10th 2013- -1F - First Sub zero reading in over 2 years (2yrs 9 mos). November 17th 2013- 53mph Wind Gust! Damaging Tornados in Washington IL. and Coal City IL. October 22nd 2013- First Snowflakes of the 2013 winter season fell today just before 3pm. September 19th 2013- High temp of 91F. This is the 18th day at or above 90F. September 11th 2013- High temp of 92F. This is the 17th day at or above 90F. September 10th 2013- High temp of 95F. This is the 16th day at or above 90F. September 09th 2013- High temp of 94F. This is the 15th day at or above 90F. August 30th 2013- High temp of 93F. This is the 14th day at or above 90F. August 27th 2013- High temp of 92F. This is the 13th day at or above 90F. August 21st 2013- High temp of 90F. This is the 12th day at or above 90F. August 22nd 2013- Rain has finally fallen in a significant amount, 1.81 inches. This is more rain then we had in the last 55 days combined!!! August 03rd 2013- This is the 52nd day at or above 80F. August 01st 2013- We finished the month of July with 0.54 inches. The normal July precip is 4.45 inches. That is a 3.91 inch deficit for the month. For the year we are at 26.67 inches. The normal for the year through July 31st is 23.41 inches. That gives us a surplus for the year at 3.26 inches. July 23rd 2013- For the month of July to date we only have 0.14in of rain. The normal July precip is 4.45in. Coming into July we were running a 6in surplus. We will end July with at least a 2in surplus for the year, but with the lack of rain this month the farmers really need the rain for their crops. July 23rd 2013- Today is the 48th day this year at or above 80F. July 20th 2013- 90.7F at 4:30pm. This is Peotone's 11th 90F temp of 2013. July 19th 2013- 95.8F at 4:30pm. This is Peotone's 10th 90F temp of 2013. The Heat index reached 110.8F at 2:40pm. July 18th 2013- 95.5F at 4:30pm. This is Peotone's 9th 90F temp of 2013. July 17th 2013- 94.8F at 4:30pm. This is Peotone's 8th 90F temp of 2013. The Heat index reached 108.6F at 2:40pm. July 16th 2013- 93.2F at 4:30pm. This is Peotone's 7th 90F temp of 2013. July 15th 2013- 93.0F at 4:30pm. This is Peotone's 6th 90F temp of 2013. The Heat index reached 108.6F at 2:40pm. July 14th 2013- 89.9F at 4:30pm. This counts as Peotone's 5th 90F temp of 2013. The NWS rounds up at .5. The Heat index reached 108.6F at 2:40pm. June 27th 2013- 90.0F at 4:04pm. This is Peotone's 4th 90F temp of 2013. This is also Peotone's 27th 80F temp of 2013. June 15th 2013- 80.6F at 4:16pm. This is Peotone's 17th 80F temp of 2013. June 12th 2013- 91.6F at 4:16pm. This is Peotone's 3rd 90F temp of 2013. 61mph wind gust recorded durring a thunder storm at 7:03pm. We also had 2.38 inches of rain! May 20th 2013- 91.5F at 3:28pm. This is Peotone's 2nd 90F temp of 2013. May 14th 2013- 90.4F at 4:46pm. This is Peotone's first 90F temp of 2013. With yesterday mornings low temp of 33.8F and todays high temp of 90.2F, that gives us a 2 day temp swing of 56.4F. That is the new all time record 2 day swing in the month of May for Peotone! April 30th 2013- 85.6F the 1st 80F reading this year! Last year we had 9 days at or above 80F in March!!! April 18th 2013- 4.93 inches of rain over the last 4 days. April 06th 2013- 71.3F the 1st 70F reading this year! March 05th 2013- Peotones biggest snowfall of the winter and the biggest snowfall in 2 years. 7.8 inches of snow. Our total for the winter has jumped to 17.5 inches, which is still way below normal. 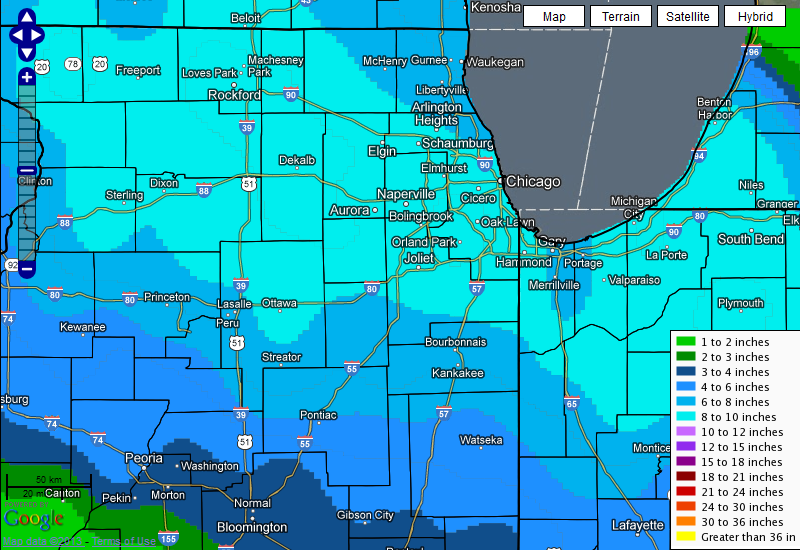 Below is a graph/map issued by the NWS that shows how much snow fell accross Northern Illinois. March 2nd 2013- So far this winter we have recieved 9.7 inches of snow. Last winter we recieved 20.9 inches of snow. The 30 year average winter snowfall for Peotone is 30.7 inches. No matter how you look at it we are behind on snowfall at this point. The good news though is that for January and February, We usually get 3.02 inches of precip (rain and melted snow). So far this year (Jan and Feb) we have had 4.93 inches of rain and melted snow. We finished last year with a deficit of 8.8 inches of precip. So we have already started to eat in to that number. With any luck this trend will continue. January 28th 2013- The last time Peotone had a 1 inch snowfall or more was one year ago today. January 27th 2013- Freezing rain! Just enough to to make all the walks and streets in town slick. January 2nd 2013- So far in the winter of 2012-2013 we have only had 0.5in of snow. Normaly 9 inches has accumulated by January 1st. So we are 8.5 inches behind in snowfall. January 1st 2013- In 2012 we recieved a total precipitation (rain and melted snow) of 31.42 inches. Normal precipitation for the year is 40.22 inches. We finished with a deficit of 8.80 inches.